Available in more than 200 custom flavors. Always worth skipping your entree for. When I was little, my mom used to tell me all about how "everyone has something that they're good at." And that always made me a little nervous, because I was pretty good at those latch-hook rug kits, and what if that was my "thing I was good at" and that's all I got. No offense to latch-hook rug enthusiasts, but I think that would be a pretty crappy way to go through life. Cheesecake is perfect for everything. Celebrating your wedding day, a birthday, or just Wednesday. Order a 9-inch cheesecake in your favorite flavor, great for any occasion or celebration. Available in 12, 16, or 20 slice options. Cheesecake minis. Order individually or in multiples. Choose from your favorite flavors based on availability. Looking for something unique and exciting for your next event? We'll create the perfect custom cheesecake to fit your needs. Almond Amaretto Chocolate Chip, Amaretto, Apple Crisp, Bailey's Chocolate Swirl, Bailey’s Irish Cream, Banana Cream, Banana Split, Black Cherry Amaretto, Black Raspberry, Blueberry Swirl, Brownie Cookie Dough, Butter Rum, Butterscotch Almond, Butterscotch Caramel, Café au Lait, Caramel Pecan, Caramel Swirl, Cherry Chocolate Brownie, Chocolate M & M, Chocolate Marble, Chocolate Pecan Turtle, Chocolate Toffee, Coconut, Coffee Caramel, Coffee Praline, Cotton Candy, Creme Brûlée, Eggnog, French Silk, German Chocolate, Guinness, Heath, Key Lime Raspberry, Key Lime White Chocolate, Lemon, Lemon Blueberry, Margarita, Milk Chocolate Almond, Pecan Praline, Pumpkin Chai, Pumpkin Pecan, Pumpkin Spice, Raspberry Chocolate Chip, Raspberry Swirl, Raspberry Walnut, Reese's Peanut Butter Cup, Rhubarb Crisp, Salted Nut Roll, Strawberry, Strawberry Daiquiri, Whiskey Pecan, White Chocolate Raspberry, White Russian, and more. Not seeing your favorite flavor? Call us, we'll make it for you. 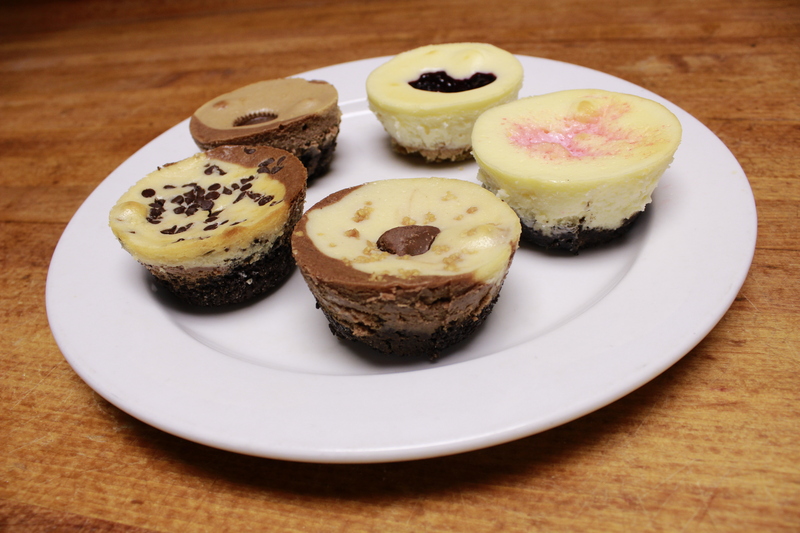 You can find Christine's Cheesecakes at local events or in the area's finest restaurants. Or, you can order one of your own for pick up or delivery. When you place your order, we'll determine timing and delivery options. For catering customers, we'll set up a time to discuss the details of your event and budget. Baked with love, by Christine herself. Because the best desserts are not found in factories. Bring home a cheesecake from Christine's for the holidays – all the holidays. Plus, studies indicate that birthdays cause less trauma when they involve cheesecake instead of some spongy, boring, layered thing. Restaurant owner? Your apps may be awesome. Your entrees may be on trend. But desserts are different. Give me a call and let's talk about adding cheesecake to your menu. Want to develop an exclusive, signature flavor? we have hundreds of combinations designed to satisfy your taste buds. Looking to have Christine's at your next event? Drop us a line and let us know what you're looking for. Ready to order some cheesecake? Fill out the order request form below.